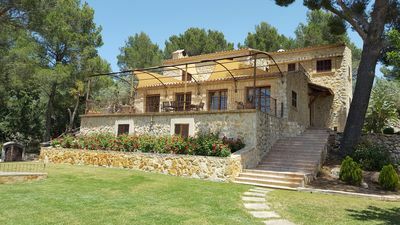 In the rural triangle of Inca, Llubi and Sa Pobla, just 14 km from the paradise beaches of Platja de Muro, our beautiful villa "Eden Son Frare" rises. This jewel was completed in March 2017 and designed & furnished with great attention to detail and high degree of excellent taste. 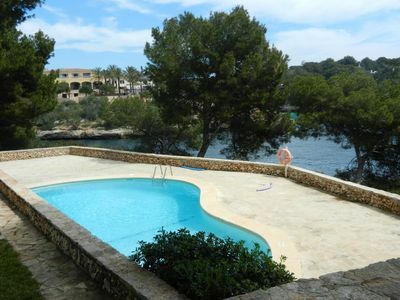 The villa is absolutely quiet, on a large piece of land with picturesque views of the Tramuntana mountains. Surrounding villages are quick and easy to reach. For shopping, for example, you can go to Inca (10 minutes by car), you can visit the weekly markets in Sa Pobla (5 minutes by car) or Sineu (15 minutes by car) and relax on the beach in Platja de Muro (12 minutes by car). Restaurants, bars, supermarkets, ATMs, doctors, etc. can be found in the famous village Sa Pobla. The surroundings of the villa "Eden Son Frare" is very agricultural and its original charm is still largely preserved. From here, very good bike tours and excursions can be started. For this, we provide you with 6 modern mountain bikes, which the owner has newly acquired for our guests. 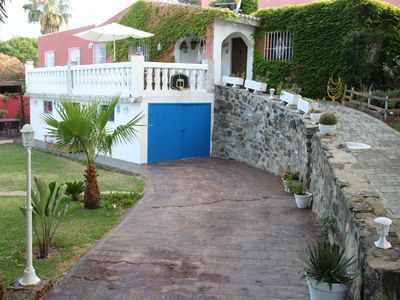 The very spacious outside area of ​​the villa is completely fenced and only by the large sliding gate passable. On the 15,000 m² large plot several cars can be parked. 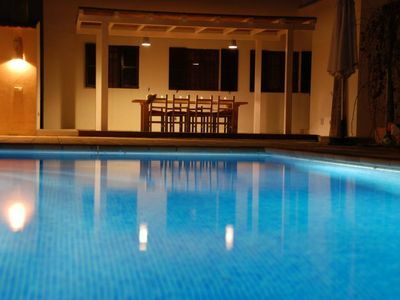 Once at the house, a huge XXL pool (16m x 7m) with an extra jacuzzi exudes. You get instantly to jump with a well-groomed head jump into the refreshing wet. The entire pool area is equipped with ergonomic sun beds, umbrellas, small tables and child-out beds. For us from 5StarsHome the ideal relaxation oasis with everything that belongs to it. An absolute plus is the modern barbecue area with a large glass front, so that during the meal you can enjoy the beautiful view of the illuminated pool area. On the huge glass table, with table legs from 2 hundred years old olive tree trunks, can be placed a whole travel group. The kitchen here is fully equipped and lets every grill fan heart beat faster. 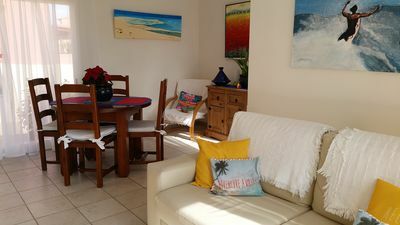 At the entrance of the villa there is also an additional recreational area with very comfortable rattan seats, a cozy place to switch off in the afternoon or coffee drinks in the morning with the favorite magazine. Now to the 550 m² interior of our dream home. 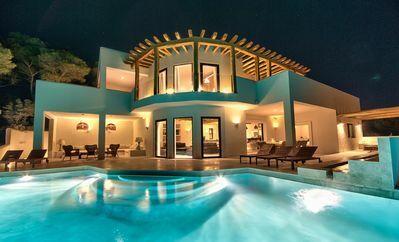 It is difficult to find the right words that would describe this dream villa adequately. 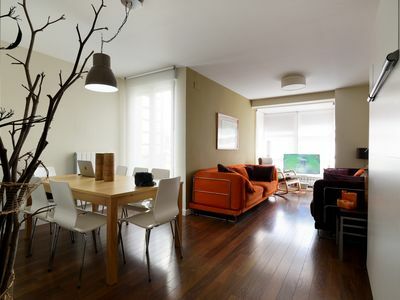 Everything, but absolutely everything is very modern, high quality and furnished with a lot of taste. The bright light-flooded design of the interior gives a very special feeling of living on 2 levels. On the ground floor there is a very stylish living room with a very comfortable upholstery set right in front of the modern chimney area, an open dining room with a large table, plasma satellite TV, fully equipped kitchen with kitchens island and a laundry room with washing machine, dryer, etc. the ground floor consists of 4 double bedrooms (3 with large double bed, 1 with 2 single beds). All bedrooms have a bathroom en suite and differ only in color design. Whether bedroom or bathroom, everything is very modern and tastefully decorated and of high quality. Fresh color accents loosen the sterile, minimalist furnishing style. Everything is perfectly coordinated. For all sports enthusiasts, there is also a fitness room with various equipment. There you can prevent annoying holiday spoil, comfortable striping in the pool but it also. The upper living area can be reached via a chic marble staircase. Here is another living room with comfortable sofa set and satellite TV. From here you have access to the large "roof terrace", which is equipped with rattan lounging furniture, dining table and comfortable armchairs. From here you can enjoy a wonderful view of the surrounding countryside in all its green splendor. The sleeping area on the upper floor consists of 3 further double bedrooms (all with double bed) each with bathroom en suite. All 7 bathrooms are equipped with modern shower heads, which make you feel like you are standing under warm summer rain, a real pleasure. All 7 double bedrooms in the house have air conditioning, satellite TV and bathroom en suite. More comfort is hardly realizable. 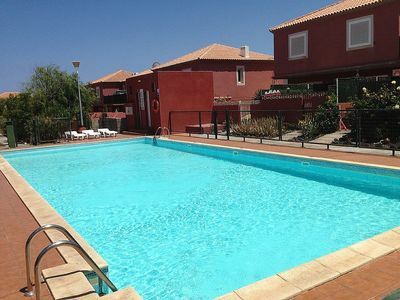 The whole house is equipped with underfloor heating, air conditioning and Wifi Internet. Baby cots and high chairs are provided. Our conclusion to Villa "Eden Son Frare": modern design with high comfort, taste and much quality. An absolute top object among Mallorcan holiday properties. 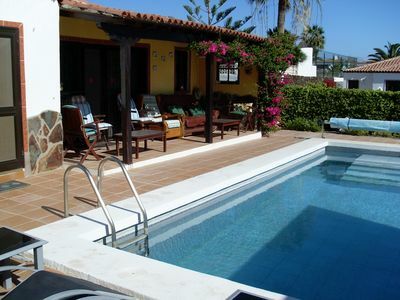 Es Pujols: HOUSE FOR RELAX WITH POOL, NEAR THE BEACH IN ES PUJOLS AND WITH FREE WIFI.